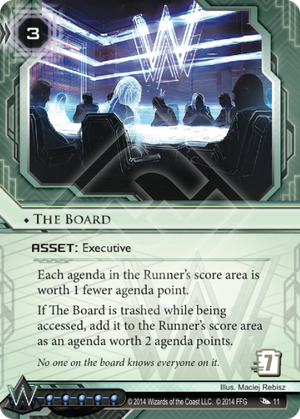 Each agenda in the Runner's score area is worth 1 fewer agenda point. If The Board is trashed while being accessed, add it to the Runner's score area as an agenda worth 2 agenda points. No one on the board knows everyone on it. Executive Boot Camp to play it as a 1-of, saving influence in the process. Architect and Self-Destruct work really well, since The Board nets the Runner with 2 Agenda points only if it is trashed while it is accessed. Which means the Runner accessing the Board from Archives is not an issue. It occurs to me that it would be entirely possible to build a deck using entirely 1-point agendas; you'd only need 7 different ones, and there are 5 in Weyland and 5 Neutral. With that deck, and this card in play, it would be impossible for the runner to win. There are plenty of things that could go wrong with this plan; with such high agenda density, the runner could win before you get The Board in play. If you do get them out, you'd need to protect them fiercely; once the runner gets enough agendas, they can kill them to trigger a win immediately as all their agendas jump back up in value. Still, it seems like a fun deck concept to build around... might be able to make it work. Thinking about building Jinteki PE with this, Philotic Entanglement, and 1-pointers. Probably one copy of The Board with some Boot Camps to tutor it up. That leaves enough influence for some good end the run ice, but not a lot of it. Maybe a package of situational one-ofs to be able to search up with Boot Camp. Pretty much the only things I'd want to ice up are The Board, Philotic, and HQ (because of Account Siphon and Vamp). Wouldn't rez The Board until I absolutely had to, of course. Seems like a fun idea. This card would be interesting but it's unusable because of the existence of Rumor Mill, there is nothing you can do to prevent the runner from simply winning when he has the scores he needs by popping rumor mill. It's a shame, but it requires to much building around to make it eventually working. The weakness to one very prominent card makes this unusable for tournament play. The Board has a lot of incredible potential out of faction when paired with executive boot camp, especially in Industrial Genomics. With the plethora of 1 point agendas and the ability to make archives un-runnable with multiple Shi.kyu, Shock!, and Hokusai Grid, the runner won't be able to keep up with your plans without coughing up 17+ credits, and to make things worse you just installed a Caprice / Ash to protect it. The downside to running this sort of strategy is that it is incredibly difficult and impractical for the corp to win a 35 minute tournament match by scoring 1 pointers, so you must look for a flatline victory. This is very easy for Jinkeki and between un-trash able Ronnins and Neural EMP, once the board is in play and archives is un-runnable, it is only a matter of a few turns before you have an easy flatline win.1 The Board and 3 EBC are obviously essential for this strategy, but other good includes are reuse, daily business show, and anonymous tip. Remember your strategy isn't to score or to stop the runner from scoring, only to get the board up and un-trash able, followed by a flatline as quickly as possible, you can be sure the runner will catch on and begin only clicking for creds!